Mullein has long been one of my favorite tonic herbs and a special winter into early spring companion. This magnificent plant is like the elephant of the garden with its ears of broad, basal, furry leaves and its flowering trunk of nearly six feet tall. It is a native of Europe and temperate Asia, but has been naturalized across the globe. Upon its arrival in America, Native American culture quickly adopted the plant and used it in ceremonial smoke and as medicine. It takes two years for mullein to produce a stalk of its lovely yellow flowers, which like the leaves and the root, can be used medicinally. The stalks themselves can be made into torches by dipping them in beeswax or suet, and were traditionally used in religious ceremonies. The leaves of mullein can be picked in the first year and into the second spring, before the flowering stalk is formed. Their broad nature and tiny hairs remind us of the microvilli (little hairs) that live on the inside of our mucus membranes in the lungs and intestines, which serve to sweep mucus out of the body. 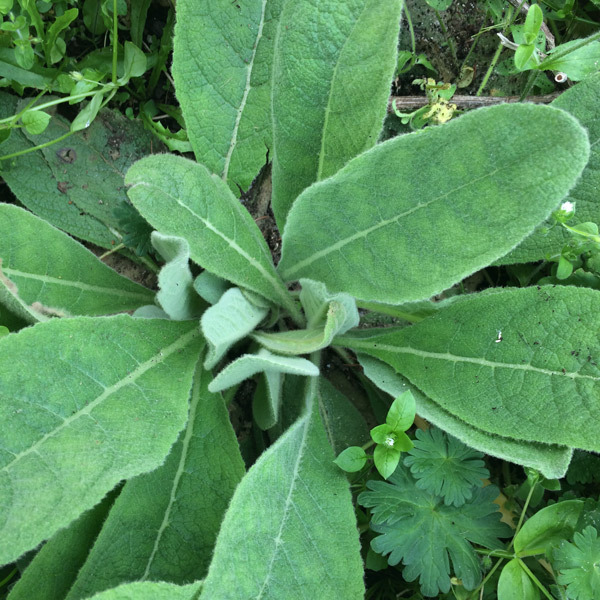 Therefore mullein is a specific remedy for moving excess mucus out of the respiratory passages and digestive tract. It works for acute respiratory illness, congestion and dryness of the tissues, including; coughs, hoarseness or irritated throat, asthma, and bronchitis. I discovered its virtues while living in Britain with cigarette smokers. I included mullein in my daily herbal tea blend to keep away a ‘smokers cough’ and soothe my irritated throat. I highly recommend it when traveling to places with high levels of air pollution. The leaves of mullein also help soothe and mend tissue in the case of hemorrhoids, ulcers, acid re-flux, dysentery, inflammation of the eyes and gout. It works well as a poultice – one large leaf can be softened in hot water and placed over wounds including herniated discs and broken ribs. I have used it for easing scoliosis and Mathew Wood suggests that “Mullein has the intelligence to set bones.” For a winter sore throat with swollen glands and fever, try making a strong tea of mullein leaves and use that to saturate a flannel or soft towel that you wring out and wrap around your neck. Wrap a plastic bag around that, then a scarf and let it do its magic for at least a half hour. It will bring down the swelling, relax the tissues and pull out excess heat. Mullein has long been used for nerve pain. A decoction or tincture of its roots can be used for toothache and cramps. Where the leaves are cooling and can be applied externally to the skin to relieve sunburn, the root is warming and can be used for cold mucus conditions of the kidneys and bladder. Mullein root is used for treating mild cases of incontinence as caused by heavy lifting, coughing too hard, temporary stress conditions and weakening of muscles. The flower oil is excellent for earache. Pick the flowers and infuse in olive oil for a month to collect the flower oil. The oil of mullein flower can be dropped in the ear for pain and congestion of the Eustachian tubes, and is often combined with garlic oil for infection. While I can write on and on about mullein, I will stop here and simply suggest that you try this gentle yet persistent healing plant.